Kingborough Lions have climbed out of last position on the PS4 NPL Tasmania ladder, claiming their first win of the 2016 season, comfortably accounting for a disappointing Clarence United 4-1 at Lightwood Park. It was a must-win with both teams entering the encounter desperate for maximum points but it was the Lions that stood tall, proving far too good for the Reds. 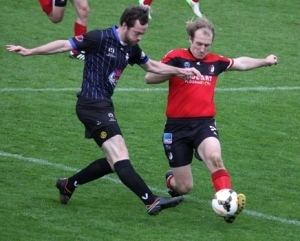 Lions English utility Shane Cartwright played chief destroyer for the hosts with a commanding role in an overall dominant midfield performance from the Lions. It was he, who opened the account for the home side, netting an opener with a simple tap in past a lunging Dyson. Chris Downes and Jack Gates worked it well up the pitch with some delightful interplay on the left wing before a scuffed Trent Pearce shot found the Englishman, who poked it home. Cartwright then pulled the strings in a dominant period, where the Lions posed questions of United. Kingborough eventually made it 2-0 in the 26th minute with Danny Cowen firing home a penalty. The Reds midfielder obstructed his opponent inside the penalty area and referee Kim Barker pointed to the spot, where Cowen calmly converted. Kingborough continued to control proceedings and Gates should have put the match to bed and made it 3-0 shortly after the restart. The winger was put through one on one with Dyson but opted to veer wide and wait for support rather than approach goal, coughing up a golden opportunity only salvaging a cross that was easily cleared. It didn’t stop the Lions though with substitute Tom McDonald adding a third on 67 minutes. It came through a passage of play that aptly summarised Clarence’s afternoon, with Henry Lush selling Dyson short with a sloppy back pass and McDonald blocking his attempted clearance to send it trickling into Clarence’s net. After an industrious afternoon on the flank Gates rounded out the Lions scoring with a superbly taken fourth goal. Mark Grace assisted the finish with a long raking ball out of defence finding Gates, the attacker beat his marker in Adrian Lawler and struck it home into the top right corner. He then went close to a brace, forcing Dyson to produce two great reflex saves to deny him after an electric counter attacking run from Keiron Dale. Clarence claimed a consolation goal in the 80th minute with Grant Malcolm finishing off a penalty but it was too little too late as the Lions coasted home. It was a tremendous result for the Lions, with their maiden win for 2016 seeing them leap up from last and into sixth position. Assistant Coach David Cooper was delighted to get a big win at home. “A great feeling, the boys have been growing in belief over the last few weeks and it is really good to be able to go out there and put a performance together and get four goals and three from open play, we are really, really happy with that,” Cooper explained. On paper, Clarence United fielded what appeared to be their strongest team of 2016 but produced their worst performance of the season. United Coach Alan Jablonski was bitterly disappointed with the 4-1 loss. The reds gaffer said the first round in the NPL has been a failure for the club. “You look at games you could win, games you should win… it is a failure, three points a round is a failure. We really need to reassess, Devonport away next week, it is up to the boys. “Training is getting better slowly but for me there is still not the commitment level required for this level of football. You can see, the first 20 minutes of that game they (Kingborough) ran us off our legs with continuous movement and that is a credit to them they obviously knew this was a chance to win and they took it,” Jablonski said. The Lions hit the road next week to face Launceston City, while Clarence face the tall task of the Strikers at Valley Road.